Mozambique has begun three days of national mourning for more than 200 victims of Cyclone Idai, one of the most destructive storms southern Africa has experienced in decades. In neighbouring Zimbabwe, the death toll rose to more than 100 and officials there said some 350 people may have died. People have been clinging to trees and huddling on rooftops since the cyclone roared in over the weekend, and aid groups are desperately trying to rescue as many as they can. The United Nations humanitarian office said the town of Buzi, with some 200,000 people, was at risk of becoming at least partially submerged. “Flood waters are predicted to rise significantly in the coming days and 350,000 people are at risk,” the UN office said. Zimbabwean President Emmerson Mnangagwa received a sombre welcome in the hard-hit mountain community of Chimanimani, near the border with Mozambique. “We do not want to hear that anyone has died of hunger,” Mr Mnangagwa said. Clutching a bag of his few remaining possessions, Amos Makunduwa described the devastation with one stark sentence. “There is death all over,” he said. “It is beginning to smell really bad,” he added. 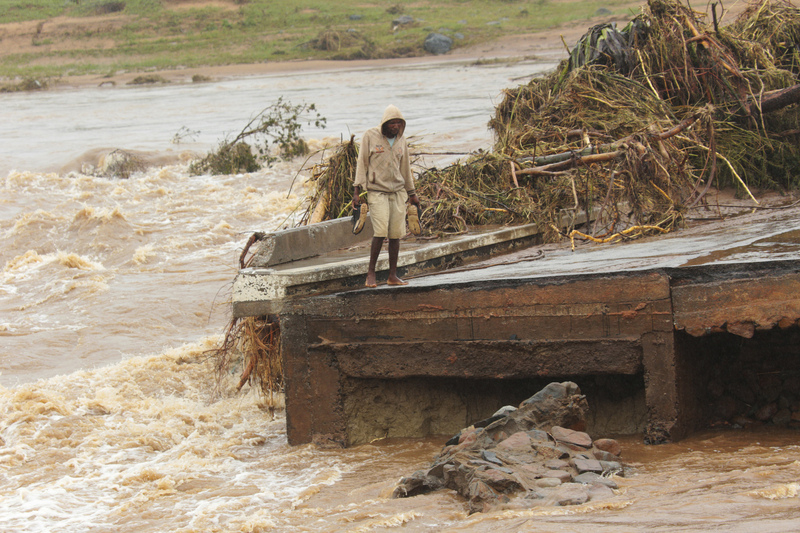 The force of the flood waters swept some victims from Zimbabwe down the mountainside into Mozambique, officials said. “Some of the peasants in Mozambique were calling some of our people to say, ‘We see bodies, we believe those bodies are coming from Zimbabwe’,” said local government minister July Moyo. Entire villages were swept away, said General Joe Muzvidziwa, who was leading the military’s rescue efforts in Zimbabwe. Some people had been out at beer halls when the cyclone hit and came home to find nothing left. President Filipe Nyusi said earlier this week that he expects fatalities to be more than 1,000. Aid workers were shocked as they arrived in the Mozambique port city of Beira, estimated to be 90% destroyed. In footage shot by South African broadcaster eNCA, food and other supplies were dropped from a helicopter to a survivor standing waist-deep in water outside Beira. Another man clinging to a tree branch was hoisted to safety. Rescuers cradled small children, keeping them warm. International aid has started trickling in to ease the humanitarian crisis. “Everyone is doubling, tripling, quadrupling whatever they were planning,” said Caroline Haga, of the Red Cross in Beira, Mozambique, referring to supplies and aid workers. The United Arab Emirates pledged 4.9 million dollars to Mozambique, Zimbabwe and Malawi, the Emirates News Agency reported, citing the Emirates Red Crescent. Norway said it was providing 700,000 dollars. The chairman of the African Union Commission said it would provide 350,000 dollars in immediate support to the countries. The European Union released 3.5 million euros (£3 million) in emergency aid, and the UK pledged up to £6 million. Tanzania’s military has sent 238 tons of food and medicine, and three Indian naval ships have been diverted to Beira to help with evacuations and other efforts. Sacha Myers, of the nonprofit Save the Children, described overflowing rivers and dams, and said getting in aid was difficult, with roads and bridges washed away or submerged in the region. “There are large areas where people are really finding it difficult to find sources of clean water,” said Gert Verdonck, the emergency co-ordinator for Doctors Without Borders in Beira.